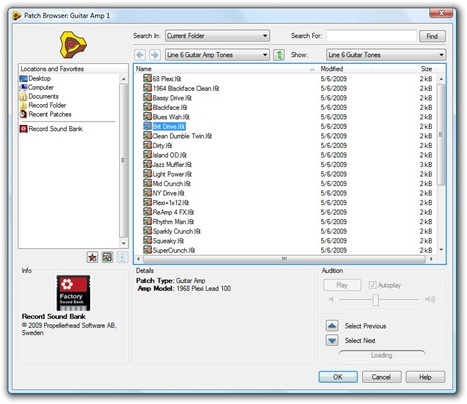 What do you really want from a recording tool on a computer? The Digital Audio Workstation answer to that question has for years been on giving you a generalized set of tools that try to anticipate every possible need. 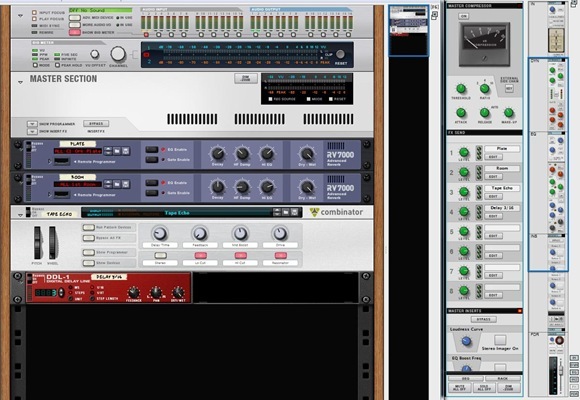 The “workstation” approach puts a whole bunch of functionality in one place, in particular adding features like plug-in hosting for supporting third-party effects and instruments, video editing and scoring, and music notation. 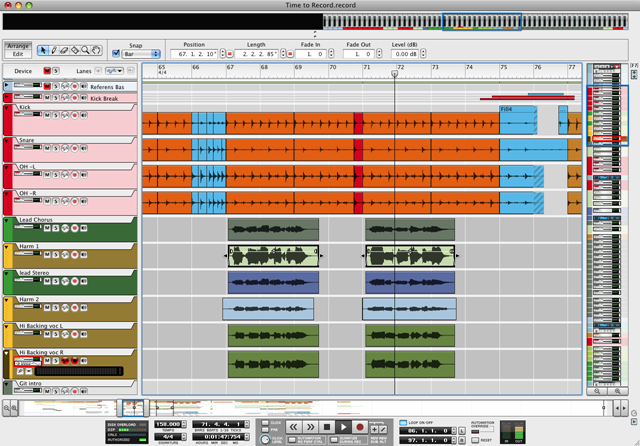 Record is a different animal: it’s a specialized tool focused on making music with audio, instead of a generalized tool. Reason has focused on synths, with a distinctive set of hardware-styled modules in a virtual rack. Record focuses on sound, with a distinctive set of hardware-styled modules in a virtual rack. Get it? What’s left out is important. There’s no plug-in support, but by limiting use to the internal sound modules, Record is entirely agnostic about things like sample rate and can be far more flexible with modular audio routing and fluid tempo changes. (There’s also no MIDI out support, but if you’re looking to sequence external hardware, I might look elsewhere, anyway – especially with gems like Numerology out there.) Record also supports ReWire and has various export features, so the assumption is that – as with Reason – when you really want plug-ins, you can use your existing environment of choice. Maybe you can call the results a DAW, if you really want to. But the one thing that isn’t debatable: Record is Reason for sound. CDM was first with the official story from Propellerhead over the weekend, talking about the philosophy behind Record. Now we can talk about the specifics inside – and I have a test version here I’ve been working with while on the road. All about “Record”ing – with comps: As the name implies, the real soul of Record is recording. Comping is built in from the beginning so that you get a take you want, and each track even includes an integrated tuner by default. This is really a tool that assumes you’re actually one person plugging in an instrument and playing. Music and tempo-based sound: “Tempo-independent” audio is almost the reverse of what this is. When you record sound, the idea is that you always have some musical information in mind – beats and bars. Record lets you then change the tempo of that audio fluidly, without ever having to think about warping or slicing or markers or loops or anything like that. Propellerhead says they’re especially proud of the audio quality of the stretching algorithm working behind the scenes to make these changes sound good, which is what we’re already hearing (unofficially, of course) from beta testers in comments and elsewhere. Tempo changes: Unlike other tools that have focused on DJ-style or electronica-style master tempo, Record assumes fluid changes in tempo from version 1.0. There’s always a “conductor” track, a main tempo lane, which can have subtle, curved tempo changes (accel./rit.). When you export your audio, that information is exported as MIDI, so this musical information travels with you to other tools. An integrated recording/mixing/arrangement environment: This is the one DAW-like part of Record, though it still feels more like Reason than anything else. Each track gets three things: a channel routed into the mixer, an individual device module you can insert into the rack (as in Reason), and a sequencing lane for MIDI and audio. Sequencing: This is the most traditional part of Record – you do get conventional sequencer lanes. Clips can arbitrarily contain audio, MIDI, and automation data. The important thing to note is that, because Record doesn’t support plug-ins, you can count on consistent integration of automation – if there’s a knob in a module, you can automate it in the sequencer, just as in Reason. 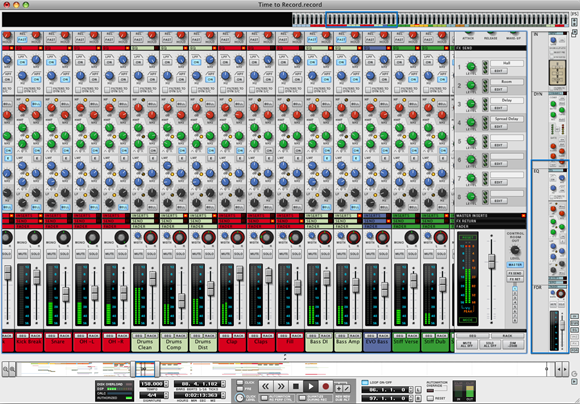 Reason-style effects: In addition to the mixer, you get Reason-style modules for EQ, dynamics, and other effects. Line 6 guitar effects: Line 6’s virtual POD is built in, so you get their guitar amps and cabinets built in. I’m guessing those should be quite nice with keyboards, too. Arrangement: Looking at the birds-eye view, Record does admittedly look like a DAW. But dig in a little bit to how these modules work, and there’s more Reason DNA than anything else. It’ll be interesting to work with these modules over the coming months. Also, most important to recognize is that when you see audio in Record, it will always obey tempo changes you make, including gradual speed increases and decreases – no warping or slicing required. When you do want to slice up audio, you could, say, drop Record as a ReWire client into an Ableton Live set, or even export your audio with tempo changes from Record as one track and put your sliced audio in a different rack. For Reason users, this one image pretty much sums everything up. The workflow is still essentially a Reason workflow – if you love that, you’re likely already salivating. If not, it’ll likely take more convincing from the other aspects of the tool. Every track is a rack: Each time you create a track, you get a modular rack, which translates to the inserts you see in the mixer. For advanced users, this means you can do anything with routing you want. 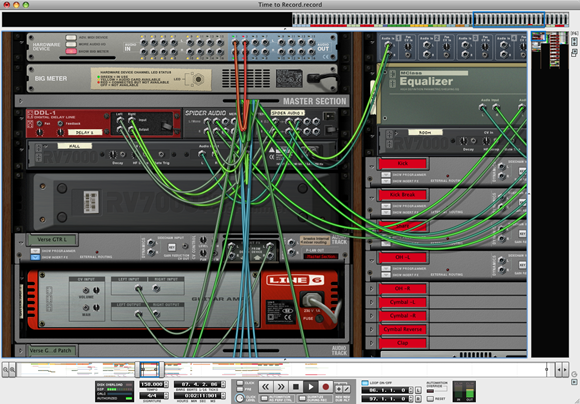 You get a full-blown rack on each track, with all the usual goodies for routing. 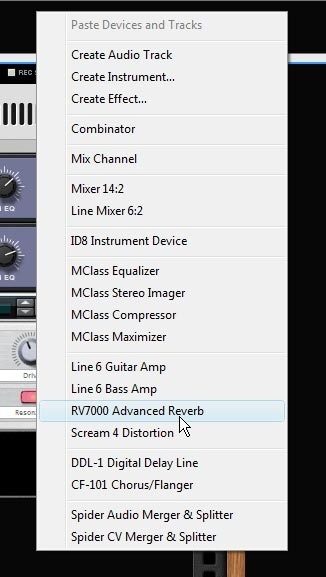 For beginners, it means you can call up easy presets for whatever you’re doing, and the parameters show up as plain-English knobs in the mixer. You don’t have to think about routing or what everything represents; you just focus on sound. For beginners and advanced users, the ability to “see” all of this routing with virtual cables and such means sophisticated mixing and routing setups aren’t quite so abstract. You get Reason patches and patch browsing, for audio: Reason users will feel right at home, as Record extends the patch browsing metaphor from Reason. And because track effects inserts use what are essentially Combinators, those inserts just feel like Reason devices inside a mixer. 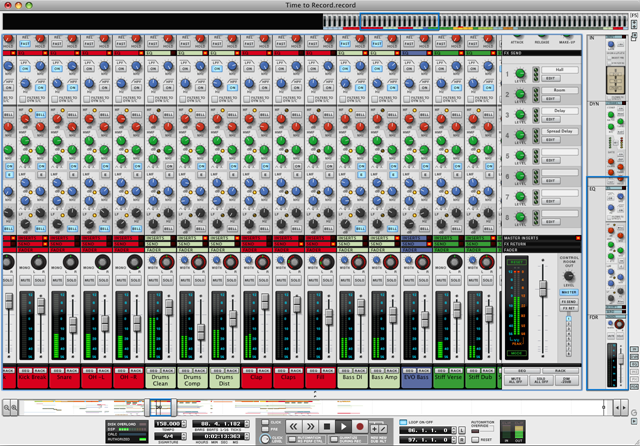 Reason + Record: If you have Reason, you have access to all your Reason modules. And since Record has a big Reason rack – well, you get the idea. 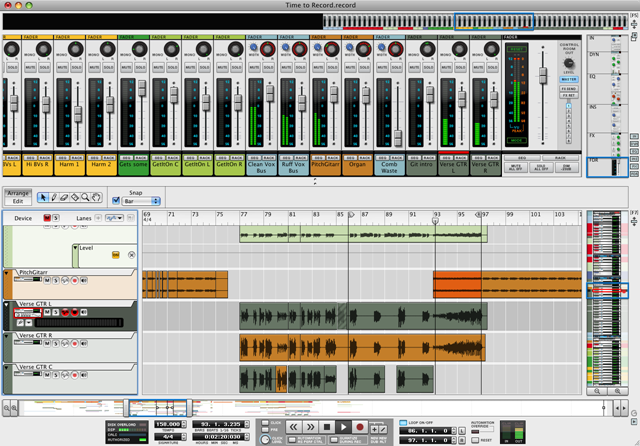 Instead of recording inside Reason, what Reason users get is Reason inside a bigger version of Reason that understands not only recording, but mixing and audio arrangement, and treats audio like music, with tempo. ReWire: Record is a ReWire client (slave), not a host (master). That should be your first clue Propellerhead aren’t trying to replace Pro Tools, Live, and Logic. But it does mean you could easily use, say, Record for recording purposes on your own, then drop it into a Pro Tools session in the studio, or Record to do some song-writing that you then bring into an Ableton live PA or remix set. Reason-style automation and control. Most notably, this is the first audio production tool I’ve seen that was set up from the beginning to be used with keyboards, as Reason was. It’s funny: right now, M-Audio are pitching using a keyboard to control Pro Tools with their Axiom Pro / HyperControl product. This essentially goes the other way: like Reason, Record uses the “Remote” protocol, which was effectively the first to “automap” your keyboard controller and control surface to the software. That means you can comfortably produce an entire work from your keyboard, while adding guitar or vocals as an audio recording. It’s really the relationship of the device rack to the mixer and tracks in Record that make it unique, and will be fun to explore over the coming months. When you create devices and Combinators, you can easily see them in the mixer and track sections. Sends are named as the actual sound parameter, too. Because it doesn’t support plug-ins, that also means you never have to worry about the way parameter names are handled in formats like VST, though you can always return to your favorite host when you do want plug-ins since Record is also a ReWire client. Line6 guitar and bass amps are available out of the box as insertable modules. This is all you need for the interface: it’s aggressively simple. The patch window will look familiar to Reason users. But if you’re new to this, what it means is that you can easily surf through, say, Line 6 guitar presets and hear immediately what they sound like. So, what does the music sound like? Josh Mobley via Twitter tells us about his official demo song, “Push Me Down,” made in Record for Propellerhead. All the songs in the embedded player below were made in Record, with the exception of “Narrow Escape,” the demo for Reason 4. The good news: “demo” mode / non-authorized mode is actually only “open”-disabled. You can even save files in the demo; you just can’t open existing files. The Ignition Key comes free with the tool rather than being a separate purchase as with some iLok products, and if you lose or break it, a replacement is available for a nominal fee. (Some manufacturers actually have the gall to charge for the full purchase price of the product or close to it, which is utterly ridiculous.) Also, if you don’t want to use the key, there is an Internet authorization. The bad news: it is still a dongle. Internet authorization requires a consistent connection while you’re working; the moment that’s dropped, the software reverts to demo mode. I would personally much rather have seen one-time Internet authorization as is available from Ableton and Native Instruments, among others, especially as Record would be fun to use on a bus or train without plugging in a dongle. Propellerhead say they’ve put some thought into this and wanted to do copy protection right, but I expect they’ll hear about it anyway. The one upside I do see is for people who use a lot of machines (like myself, for one). You can use just the dongle without any other authorization, and you can use it on as many machines as you want. So that means you can move from a studio to a Mac laptop to a PC laptop to a netbook just by moving your dongle around, and never have to fill out a registration form or worry about if you’ve run out of authorizations. Also, I’d suggest that people use this as an opportunity to freely try the demo without any annoying limitations and decide if you like the tool before you buy it. Beta testing is starting now, today – sign-up at the site below. September 9, 2009 is the official release date. Suggested retail: US$299, EUR299. No word yet on what bundles will be available for existing or new Reason users, but Propellerhead says that it will have special bundle pricing of some kind. It’s been a long, long wait for side-by-side Reason and audio racks and recording in Reason, but there’s no question that this is a big announcement. Since many of you will be beta-testing this alongside me, I look forward to hearing your opinions of the tool and any tips or techniques you discover.